(1959) Peter Falk, Jack Betts, Barbara Lord. 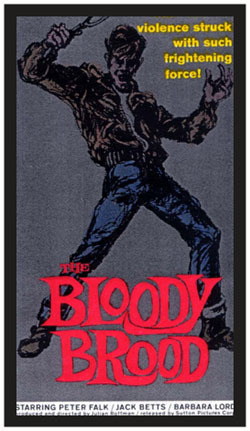 Intense and sometimes brutal film about a drug dealing gang of beatniks who get their kicks by perverse and violent means, (They feed a messenger boy a hamburger laced with ground glass). Well done for such a low budget vehicle. Falk is great. 35mm.